With AwesomeLock you can get the latest news, weather info, currency exchange rates, calendar events, tasks, Facebook notifications, tweets, favorite stocks and many more directly from your phone's lock screen. AwesomeLock is the best way to customize your phone’s lock screen with information tailored for you. The information in lock screen will be automatically updated every 30 minutes. - New feature: Awesome Peek! 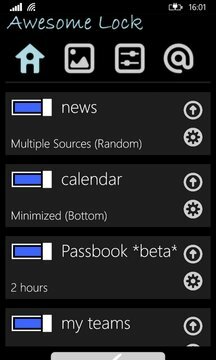 Add as many widgets you want to a quick access view. It also allows you to see the details of a headline you see on the lock screen. _ Some default news sources: CNN, Al Jazeera, El País, Le Figaro, Skynews, Financial Times, UEFA, The Times, and many more.